Aaron Franklin may be the reigning king of brisket, but in his off-time, what he really loves to cook and eat at home is steak. So, in this follow-up to his New York Times bestselling book Franklin Barbecue, the pitmaster extraordinaire teaches readers how to cook his favorite food to absolute perfection. 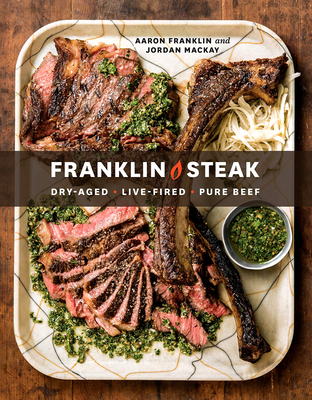 With their trademark rigor and expertise, Franklin and coauthor Jordan Mackay go deeper into the art and science of cooking steak than anyone has gone before. They demystify cattle breeds, explore the technique of dry-aging, explore globally-inspired techniques like the reverse sear and hibachi-style cooking, and even teach readers how to build a custom, backyard grill setup. For any meat-lover, backyard grill-master, or fan of Franklin's fun yet authoritative approach, this book is a must-have. AARON FRANKLIN is one of the biggest, most recognized names in barbecue and the wider food world. His restaurant has won every major barbecue award and has been in magazines ranging from GQ to Bon Appétit. The line to get into Franklin Barbecue is as long as ever, and the restaurant has sold out of brisket every day of its existence. JORDAN MACKAY is a James Beard Award-winning writer on wine, spirits, and food. His work has appeared in the New York Times, Los Angeles Times, San Francisco Chronicle, Wine and Spirits, Food & Wine, and Gourmet, among others. He has co-authored four cookbooks: Passion for Pinot (2009); Secrets of the Sommeliers (2011), a James Beard Award winner; Two in the Kitchen (2012); and Franklin Barbecue (2015), which spent 12 weeks on the New York Times bestseller list. "A thoughtful deep dive into a much-loved American mainstay." "Whether you’re a grill master or just want to learn about beef, Franklin Steak dives deep into the art and science of cooking steak, making it a welcome addition to any meat-lover’s collection." "Much in the same way that a barbecue spot isn't exactly a restaurant, and a pitmaster isn't exactly a chef, Franklin Barbecue isn't exactly a cookbook. There are only eleven recipes: the brisket, of course, plus instructions for making pork ribs, beef ribs, a turkey breast, four sauces, beans, potato salad, and a remarkably good coleslaw. That's okay, though. Much like a book of Ono explaining nigiri, or Starita explaining a margherita pie, Franklin's recipes are meaningless without the man behind them. And so the bulk of his book is devoted to him explaining himself, in the good way: it's a book that unpacks his obsessions, his thought processes, his extraordinary focus on detail and technique."